Fist off, I’m officially ONE MONTH from my EDD/guess date. HFS! I know this will be a boring post for a lot of you, but I kind of like documenting every step of this process, so here ya go. 🙂 This is the one and only peds group in the area (and by area, I’m talking a 60 mile radius of the office, which means 90 mile radius from my house). We could have chosen to go with a family doc, but I never really picked one when I moved here, so I’m not attached to anyone in particular and figured I might at well go with an actual peds office for the kiddo. Their office is in the same block as my midwife office and just one block over from the hospital, so that’s kind of nice too. They also have a good website, which is a huge perk in my mind. Gotta be current with technology you know! 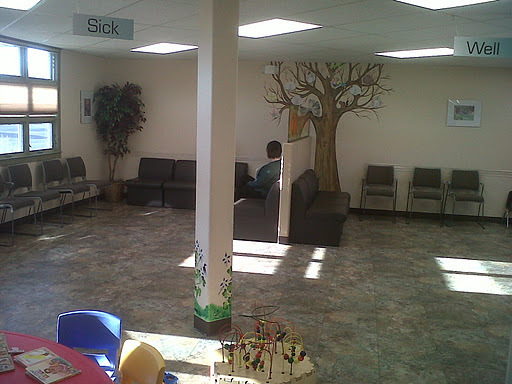 The waiting room, divided into teen (not pictured), sick, and well areas. I stole the peds questionnaire below from this website in case you’re interested. · Do you accept my insurance? (It’s always good to double-check!) Yep! · What is your background: how long have you been a doctor, and how long have you been associated with this practice? Did med school (6 yrs) in the Czech Republic from ’88-’94. Married an American, had a baby, moved to the states, did her residency here. Was a practicing pediatrician in Albuquerque for about a decade and has been in the local area since August 2010. · Are you board certified? In what specialty? Hm, didn’t ask this. She’s an MD, that’s all I know. · Do you treat parents as a partner and let them be very involved in all of the decision-making? I didn’t specifically ask her this, but just from our conversation I’d definitely say yes. · Do you practice only conservative medicine? What is your philosophy on holistic medicine? She believes strongly in the benefits of western and eastern medicine working together. · How often do you recommend well child visits? Do you see my child, or does another doctor in the group or a nurse practitioner see my child? We just talked about the first few visits at 3-4 days post birth, 2 weeks, 2 months, 4 months, 6 months, etc. When I call and make an appointment, I can set it up with her specifically If the child is sick and needs an immediate appointment, I could end up seeing any of the five docs in the practice. · Will your office send immunization reminders for my child? I didn’t ask this because we’ll be doing a delayed vaccination schedule (which she was very supportive of). She’s pro-vaccine, but also agrees with the philosophy of spacing them out more, and agreed with me wanting to wait instead of giving HepB at birth. · What are your office hours? Do you offer early, late or weekend appointments? Regular office hours are 9=5, but 7:30-8:45am is open for same-day sick visits (first come, first serve), and 5-6pm is open for same-day sick visits (by appointment). · Will I be able to get a same-day appointment if my child is sick? Who sees my child, you or another doctor/nurse practitioner? Definitely. See above for set aside hours, plus there are always blocks during the day kept open for this purpose. She would see us if possible, but it could be another doc (which makes sense to me). · Do you offer telephone triage and advice by pediatric nurses? What hours? Is there a “best” time to call? Yes, definitely. There is one main person designated for this, and three other nurses who can rotate in to make sure there is always someone available by phone if you have questions. · If I leave a message, how long will it typically take to get a return call? After hours, there is always a peds doc on call. All messages returned within 30 minutes max, but callbacks are usually done immediately. · How are emergency calls handled by your office? See two questions above. A doc is on call 24/7. · How are calls handled after your office has closed? Again, see above. · What tests are handled here, and which have to be performed somewhere else? Where? Basic blood and urine tests are done there, but quite a few are done at the hospital (which is 1 block away). That’s pretty standard for our area. · Do you have resources to help with billing questions or insurance claims? Oops, didn’t ask. · Did the doctor volunteer information or wait for questions? A little of both. Her nurses chatted with me for 10 minutes while we waited for her, and she actually was incredibly helpful and full of information as well. · Did the doctor listen to your questions? Yep. · Did the doctor genuinely like children? No idea since my kiddo was still in my belly, but I sure hope so! · Was the office child-friendly? Child-sized furniture? Clean toys? Yep. Child-sized tables and toys, plus different areas for sick and well kids, which I liked. They had murals painted on all the walls and hallways at child-height, which was also a nice touch. · Was the staff patient and helpful? Yes, the scheduling woman and the nurses I talked to were both very friendly and helpful. · Did you feel at ease with this doctor? Yes! · Was the doctor well-informed about preventative health measures? I didn’t really ask this in particular, but the nurse and I were talking about how they are big on using telephone triage for suggesting possible remedies that don’t necessarily require you to come in, pay your co-pay, and put your kids on prescription meds. Of course, if you want to come in, you always have that option. · Did the appointment begin on time? Yes. · Did you feel rushed? Nope. · Was there ample parking? Yes. · Did you and the doctor have similar views such as breastfeeding, alternative medicine, single parents, co-sleeping, etc.? Yes. She’s very pro-breastfeeding (and gave me some good tips), very pro eastern/western meds working together. We didn’t talk about co-sleeping but we’ll be using an actual co-sleeper bed (simply b/c our queen bed is just not big enough for 3! ), so I doubt she’d have an issue with it either way anyway. Overall, I really liked both the doc and the office. She is super healthy and outdoorsey (a good sign I think! ), believes in western & eastern medicine working together, and didn’t make me feel rushed at all (even when I knew we’d gone over our appointment time!). I rather like that she’s from a different country (the Czech Republic) and very open to the fact that there’s more than one way of doing things. I think she’s a keeper! Glad you found a keeper 🙂 So wait…all insurance providers no longer cover circumcision? That Dr sounds awesome! I did not know that circumcision wasn't covered by insurance! And thanks for the chiro comment on my blog! Sounds great! What were the tips she gave on breastfeeding? Just curious. we are interviewing in a week or so, and these are great ideas to add to our list! I love how thorough you are. It sounds like a great fit and you definitely sound like you feel very comfortable with them which is so important. I'm so impressed with all the research you do! I like to think I'm informed but you take it to a whole new level. Good for you!! i can't believe you're only a month away! so exciting! i'm so glad you found a great pediatrician and ever so grateful that you posted the questions you asked her. it didn't even occur to me to interview the candidates so thoroughly. thank you so much for this post! Your thoroughness leaves me envious! Can I give you my pediatrician's number so you can grill them?